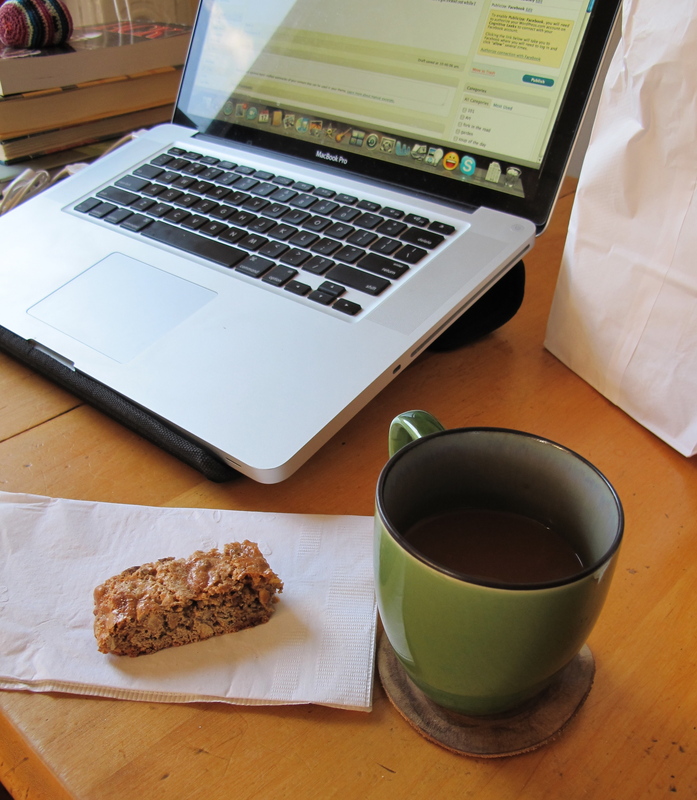 I just walked in the door from a lightening-fast stealth mission to the coffee shop around the corner and the bakery across the street for a fortifying large coffee and a couple of almond biscotti. I was worried I’d get locked out while I was gone (more on that later) despite my clever use of cardboard in the lock on the front door, but I’m up the stairs and in again. 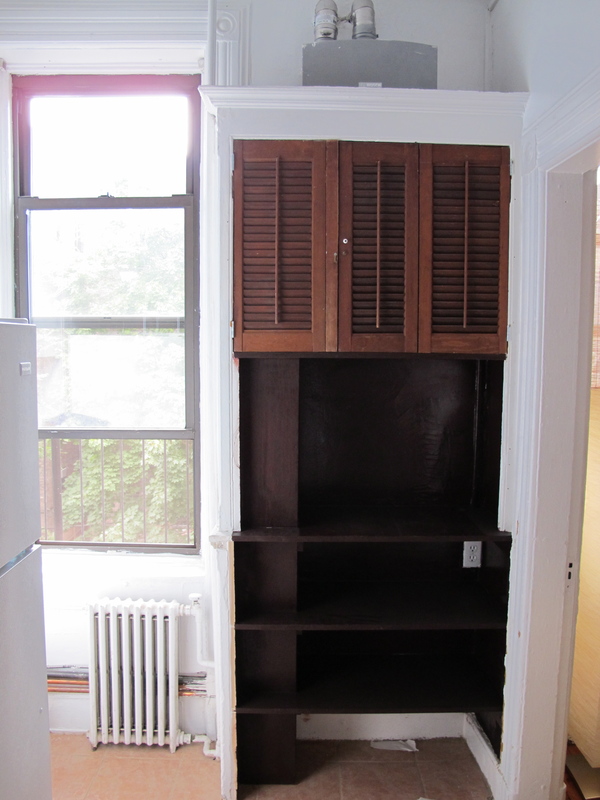 We’re in our new apartment but I haven’t been able to unpack anything like a coffee maker in the kitchen yet. Or walk on the floor without having to wash my feet off. I feel like there was a cupcake in the kitchen and someone came in and swapped it out for a big steamy cow pie. It’s even worse up close, just bad, bad work. There was no sink and no countertop or backsplash when we got the keys Tuesday. The workers came in Wednesday and sawed and tiled in the kitchen while our furniture was being moved in, did a very cursory sweep- up of the dust, and left. All of the work in the kitchen is the shoddiest and sloppiest I have ever seen, the tiles trickling downhill behind the fridge, uneven cuts, paint and grout everywhere. 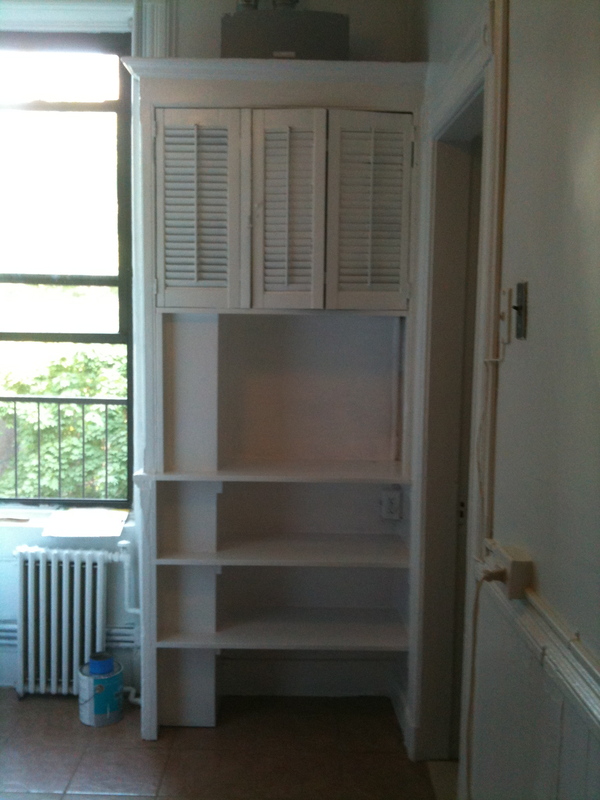 The cupboard was ripped apart and had unsanded, unfinished plywood sloppily shoved in and haphazardly smeared with a eye-watering oil- based stain. I’m not sure what to do about it yet, so I’ve been concentrating on getting the floors in the rest of the apartment clean of the paint and grout the workers left behind and making the living room and bedroom habitable. I’m not sure how to handle this. We’ll see what the owner says when Scott gets home, which brings me back around to the stealth visit to the closest purveyor of caffeinated deliciousness from which I can make a round trip in 5 minutes or less. When Scott left for a short over night trip at 5 AM the morning after we moved in, he accidentally grabbed my apartment keys and took both sets with him. So, in order to go out I have to leave my door unlocked and risk one of the neighbors closing the common street door before I get back, locking me out of the building. I sneaked out for coffee yesterday morning, but last night, after spending all day scrubbing the floors (my knees are killing me today) and shifting boxes around, I wanted nothing more than a shower and a glass of wine. Hot shower- done. Clean clothes and socks- done and done. Now for the wine and a corkscrew……hmmmm. I have about 35 boxes labelled “k-ware/glass” or “k-ware/china” with thousands of heavily paper-wrapped small lumpy objects inside. Possibly millions.Trying to find that particular needle in this haystack is an exercise in futility. I grabbed the bottle, ran downstairs, propped the door open, and went across the street to a BYOB pizza place and told them I had just moved in, can’t find a corkscrew, would they kindly open it for me? Perhaps they saw the desperate look in my eye, or maybe they are just nice folks, but they said “Sure!” and opened it and I was able to slip back into the building before anyone came out and shut the door. Now for a glass. I realize that you technically don’t NEED a glass, and I probably had a water bottle or something around that I could have drunk from, but I just wanted to sit down and drink from a proper wine glass and feel like a civilized person. 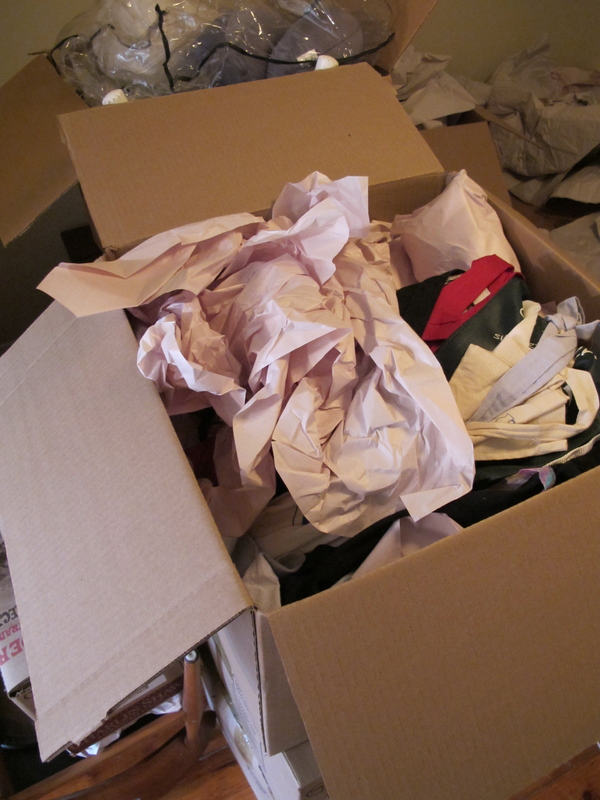 So, with a fanatical gleam in my eyes, I girded my loins, got out my step-ladder and my utility knife and spent the better part of an hour rummaging through the aforementioned multitudes of boxes (what in the world can THAT shape be? did these lumps have baby lumps while they were in storage?!?) where I ran across my coffee cup, some kitchen towels, a random handful of flatware, a million weird shaped lumps, and (cue choirs of angels and a spotlight from the heavens) a box of wineglasses!!! It’s the little things really- the spots of paint all over the floor, the set of keys that leave one housebound, the corner cupboard that was loved and lost- that can push my endurance. And it’s the little things, like a wineglass and a clean pair of socks, that can remind me that I’m still me, even though I’m way over here in New Jersey in this utterly challenging period in my life with no idea what to do about that stinkin’ kitchen. 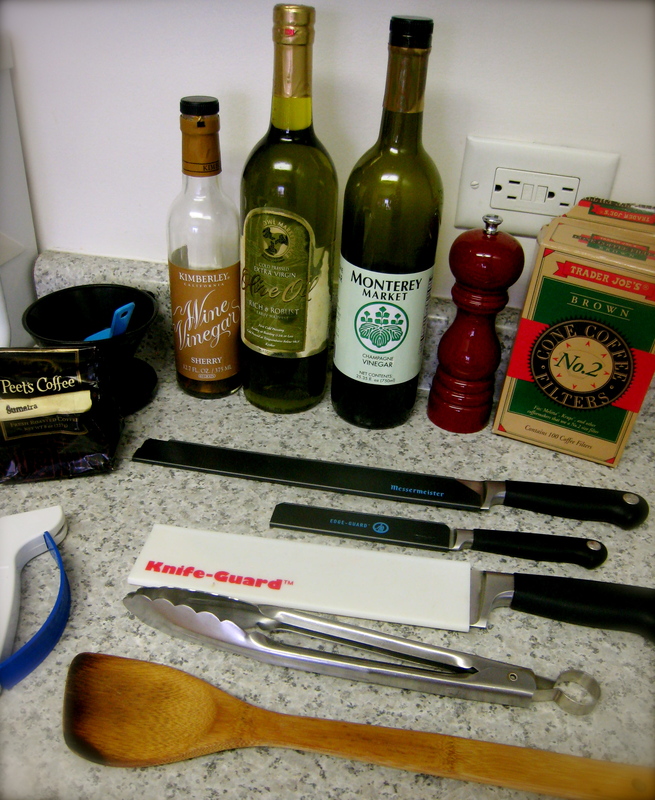 -3 knives, a small paring knife, 1- 8 inch chefs knife and my slicer. -Sherry and Champagne vinegar and olive oil- these were last-minute additions because the packers didn’t think they would make it intact in the truck, but I’ve used them a lot anyway, so I’m glad they came along with us. -my jar of good paprika, because you can do a lot to meat, pork and chicken with salt, pepper, and paprika. I tend to keep my kitchen tools pretty well-edited to things I actually use regularly; I’m not a big gadget collector. But it has been interesting to see that I can function reasonably well with a really basic handful of tools and what things I miss most when they are unavailable to me. One thing they do have here that I don’t have in my own kitchen is a microwave oven. I’ve been making microwave popcorn just because I can. But I’ll be happy to give up the microwave popcorn to cook in my own kitchen again. 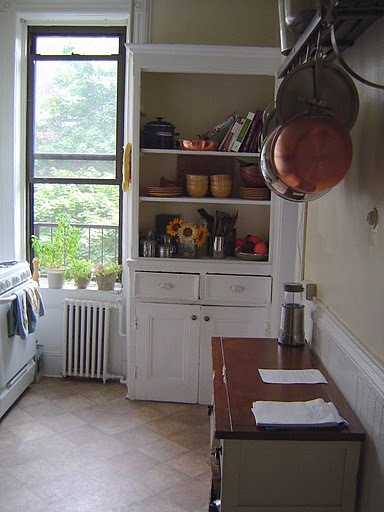 I’ll be looking at apartments today, hoping to find a kitchen that I can settle happily into very soon.